Trying to decide what neighborhood you want to look for a new home in? Click the "Search the MLS" tab and you will be directed you to my website, ShopLosAngelesHomes.com, to search all Los Angeles Area Listings! 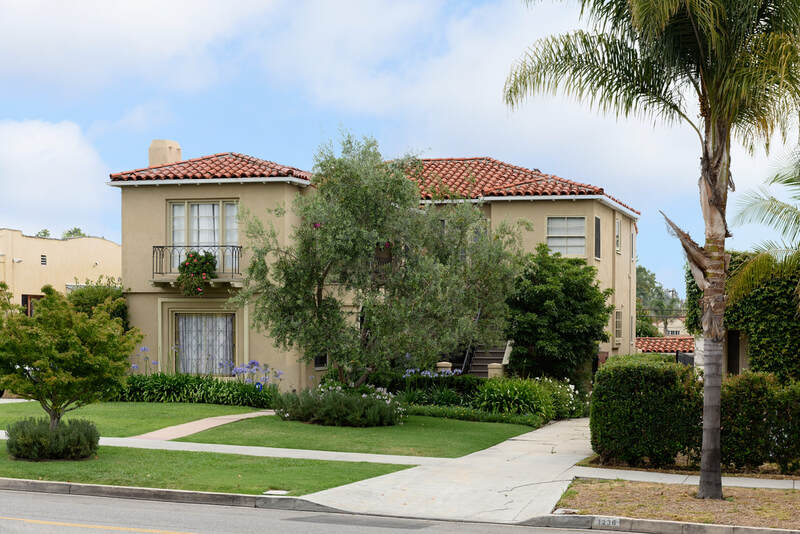 Beautiful 1930's Spanish-Mediterranean duplex in pristine condition with classic architectural details and contemporary interiors. A rare opportunity to purchase an owner-occupied duplex with both units to be delivered vacant, offering amazing potential for the owner-user or savvy investor. Each 1500+ Sf. unit floor plan has 2 Bedrooms + 2 Bathrooms, Office area, Formal Dining Room, and Laundry Room. The spacious downstairs unit offers classic coved ceilings and period-style leaded glass picture window. The light-filled upstairs unit offers dramatic open-beam ceilings, garden terrace and downtown views. Features include hardwood floors, fireplaces, updated kitchen and baths, designer appliances, and washer/dryer in each unit. The outdoor spaces provide lush, well-manicured front and rear gardens, and a 4-car enclosed garage. Strong income potential or Move-In Ready for the sophisticated owner. An exceptional opportunity! Don’t miss this extremely rare opportunity to own a penthouse unit in the coveted Wilshire Corridor. Featuring a Top-to-Bottom renovation which exudes sophistication and elegance, the floor-to-ceiling windows showcase sprawling Northeast views of Bel-Air and the Getty Center. The open floor plan features an expansive living room, fantastic modern kitchen exhibiting top-of-the-line appliances and a den with sunken wet bar with a wine refrigerator. Enjoy the convenience of living in a full service luxury high-rise with such amenities as a 24-hour concierge, heated pool, sauna, gym room and fantastic clubhouse. A true downtown LA Live/work loft in the renowned Flower Street Lofts complex. Head downstairs to The Palm for dinner then just across the street for a game at Staples, a concert at Nokia, or a fun night out at LA Live. This unique space boasts over 1500 sq feet with an open floor plan that accommodates a 1 bed/ 2 bath layout with bonus area, a large walk in closet, industrial sized windows and an amazing Staples Center view. This loft features a large kitchen with all stainless appliances and Caesarstone counters, stunning polished concrete floors, over 12 foot ceilings, upgraded cable and Internet wiring, designer finishes, and 2 secured parking spaces. This conversion of the former UPS building epitomizes the incredible rebirth of downtown LA. Immaculate, spacious, and bright 2 bedroom and 2.5 bathroom corner unit in the Full Service luxury high-rise, The Regatta in Marina Del Rey. Unit boasts large open floor plan, 2 balconies, hardwood flooring throughout, floor-to-ceiling glass, fireplace in living room, 9 foot ceilings, marble baths, separate laundry room, gas BBQ hookup on balcony, open gourmet gas kitchen with maple cabinets and granite counter tops. Building Services include 24 hour complimentary guest valet, 24 hour front desk attendant/concierge, pool, spa, sauna, professional fitness center, recreation room, conference rooms, library, theater/media room and more! SOLD WITH 16 OFFERS, ABOVE ASKING! This charming home is close distance to all of the fantastic restaurants and shops in Culver City, while being in one of Los Angeles' coveted neighborhoods, Beverlywood. This home has tons of a lot of natural light and has been remodeled and updated with all new appliances and new floors throughout. The main house consists of 2br, 1ba and the guest house consists of a studio with a full kitchen and bathroom. Previous owner was able to rent guest house separately. First time on the market in 50+ years! Turn-key apartment in highly desirable Spanish courtyard building, Laurel Palms. This charming, well maintained space is perfect for someone wanting a move-in ready space which is centrally located in the heart of the Hollywood Foothills and close to the world famous Sunset Strip. Enter a romantic courtyard and you are transported into a tropical oasis with lush landscaping, palm gardens and a trickling fountain. This classic Spanish unit has gorgeous hardwood floors, a light-filled kitchen, plantation shutters and lots of closet space! Beautifully renovated 1927 Spanish duplex located just blocks from Sunset Boulevard's shops and restaurants. The upstairs unit features 2 bedrooms and 1 bathroom. The fully renovated lower unit consists of 1 bedroom, 1 bathroom, and a den. APN 5548-016-039 is also included in sale. Buyer to verify square footage and lot size. One unit delivered vacant! Available May 1st. Beautiful private Bel Air home with gorgeous views of the oceans, canyons, city lights and mountains.Heated pool, spa, and huge outdoor deck. Exclusive Bel Air location with easy access to the valley. Property is total renovated with the highest quality finishes and fixtures. Hardwood floors, stainless steel appliances, stone fireplace, and outdoor grill. This property was recently leased to a major celebrity, and was subsequently leased to major international production company CEO. Totally turnkey and furnished to perfection!